Hello! My name is Sadie and I am a super sweet 1.5 year old Pit mix, weighing in at 46lbs. Just look at my sweet face. It matches my even sweeter personality! 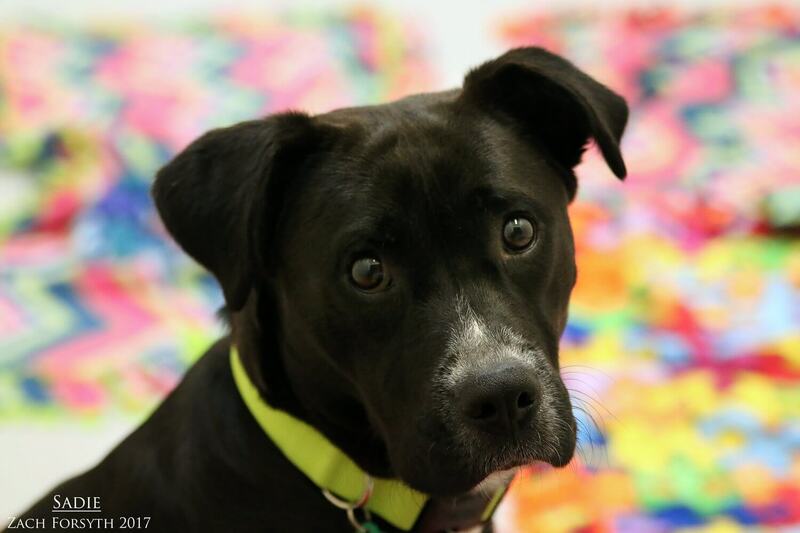 I am very fun loving girl who is ready to cuddle up next to you after a long day of running in the yard or hiking in the Gorge! I really enjoy playing with toys, though as you can see in the video, I don’t quite yet understand the concept of fetch and instead like to get the zoomies and run around to each squeaky toy and then back to you. I am quite the entertaining pup, that is for sure! The inner city is a bit much for me and I would much rather be in a quiet area on the outskirts of town in a home owned by my adopters. I have some great puppy pals here at Pixie, and though dog parks would be too overwhelming, I wouldn’t mind having another dog in the home. And of course I enjoy meeting those human friends over 14 too! And a dog savvy kitty would be just fine too. Full of cuddles, kisses, and lots of love, I am a silly girl looking for a family with a heart as big as mine! Will that be you? Fill out an application today, so we can meet. I come to you spayed, vaccinated, and micro-chipped with an adoption fee of $300.